Just Ask D: Learn The Art Of Saying NO! 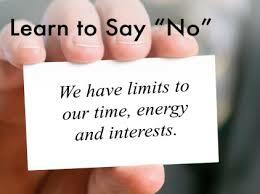 Simple Ways to Say "No" ...even when your "yes' button gets pushed. 1. Just Say No. Thanks, but I'll have to pass on that. Say it, then shut up. You don't want to ruin the effect. 2. The Gracious No. I really appreciate your asking me, but my time is already committed. This is a gentle way to say no. 3. The "I'm sorry" No. I wish I could, but it's just not convenient. The real masters of the "I'm Sorry" No somehow get the other person to apologize for even asking. Amazing. 4. The "It's Someone Else's Decision" No. I promised my coach I wouldn't take on any more projects without discussing them with her first. This postpones the decision and allows you to decide if you really want to say no. Only use when you're not sure if you want to say yes. 5. The "My Family is the Reason" No. Thank you very much for the invitation. That's the day of my son's soccer game, and I never miss those. Great reasons also include birthdays, anniversaries, graduations...just be sure you're not making it up. Tell the truth. You may think this is the easiest no to say, but it's not. How often have you said no to your family in order to work? My point exactly. 6. The "I Know Someone Else" No. I just don't have the time to help you, but let me recommend someone else I know. A great way to say no while still helping the person by giving another option. It's often easiest to say no when you can offer another solution. 7. The "I'm Already Booked" No. I appreciate your thinking of me, but I'm afraid I'm already booked that day. Use this one especially if you've blocked out time for yourself. It's horrible to break a date with someone else -- even worse if you break the date with yourself. And one more thing. Never, ever say maybe. Maybe is only a way of postponing a decision. When you want to say no, say no. Otherwise, you're not playing fair with yourself -- or with others. And saying "maybe next time" makes it harder and harder to say no the next time. Don't fall into this trap. Expand your knowledge and enlighten your mind with tools to help you excel in life. Work with a Business and Life Management Coach to achieve your full potential today! 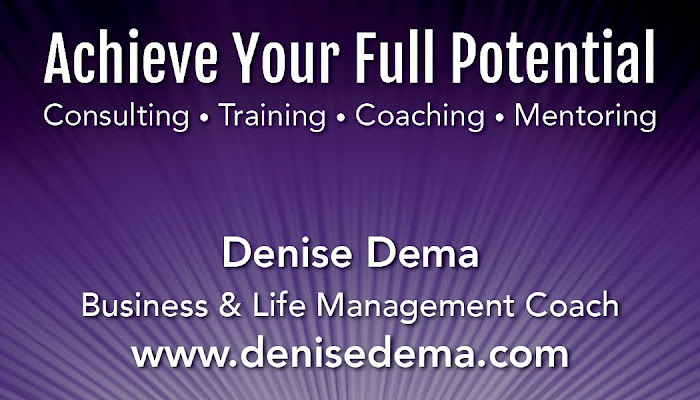 Book a complimentary session at www.denisedema.com.